Hiding in My Craft Room: HIMCR #298 - Winner! It's Wednesday AGAIN! It seems like I was just here posting a HIMCR winner! I thought I was catching up on my coorespondence! Thought being the optimum word! Because this week has been wonderful yet busy! End of the year school stuff is killing me: concerts, projects, and reports! My kindergartener just had his presentation today of his favorite zoo animal: Rhinoceros! We actually had to put together a trifold board presentation! Kindergarten! CRAZY! My 4th grader had to do a board too, on an animal he invented! And make a 3-D model of it! Paper machete is evil! All this plus 3 days a week of soccer and more! Did I mention my husband is out of the country! So please bear with me while I slowly crawl my way to someday being caught up with all the questions, comments and replies! I am so thankful you are here and for your continued support of our HIMCR challenges! So on with this week's winner! 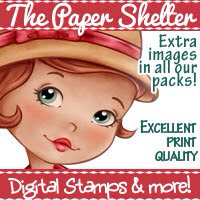 The giveaway is $15 Gift Certificate to The Paper Shelter! Congrats to our HIMCR winner this week, Lynn! Please message me through our HIMCR facebook page before next Wednesday to send me your email and claim your prize. Please put the challenge number and prize in subject of message. I have time set aside on Thursdays to respond to emails! My schedule has gotten even tighter so please be patient. I usually do not have time to check my email / messages until Thursday. Thank you to everyone for all the great entries! And thanks so much to The Paper Shelter for sponsoring our HIMCR challenge! Just also a quick reminder that next Saturday is National Scrapbooking day and our schedule will be a little different! HIMCR #302 - Any Holiday! HIMCR #300 - Super Scraps Saturday! 3rd Challenge - 2017 NSD - Thankful! 2nd Challenge - 2017 NSD - May Flowers! 1st Challenge - 2017 NSD - Scrapbooking!